During the Winter TCAs, Supernatural super-fan and president of The CW, Mark Pedowitz, addressed whether the littlest network would cancel or renew its Supernatural TV show for a 14th season and talked about the potential spin-off, Wayward Sisters. Pedowitz recently extended his contract with The CW, which seems like good news for Sam and Dean Winchester (Jared Padalecki and Jensen Ackles). Find out what he had to say about the original series and its spin-off. A CW horror drama which is currently in its 13th season, Supernatural is still a top three show for the network, so it is unlikely to be cancelled. In addition to Padelecki and Ackles, the cast includes Misha Collins, Mark Pellegrino, and Alexander Calvert. Samantha Smith, Kim Rhodes, Briana Buckmaster, Kathryn Newton, Katherine Ramdeen, Loretta Devine, Clark Backo, Yadira Guevara-Prip, Christian Keyes, Chelsey Reist, Keith Szarabajka, and Jeffrey Vincent Parise are among the guest stars in the 13th season. This season, Supernatural is also tasked with introducing a potential spin-off, Wayward Sisters, starring the original series’ standout Kim Rhodes in an episode that airs a week from Thursday. The 13th season of Supernatural is averaging a 0.61 rating in the 18-49 demographic and 1.79 million viewers. While those numbers may seem low at first glance, they’re great for The CW, particularly for a show which has been on the air this long. Compared to season 12, Supernatural is up by 1% and up by 7% and ranks second and third, respectively, out of CW TV shows. Outright cancellation seems unimaginable, unless something changes in a huge (and terrible) way. Supernatural: Where Will It End? Padalecki, Ackles, and co-showrunner Robert Singer have previously said they would like to take the TV series to 300 episodes. The backdoor pilot for Wayward Sister, which debuts when the show returns from its midwinter hiatus on January 18th, is episode number 13.13 and will be the 277th episode, overall. The 300th episode would be the 13th episode of season 14. 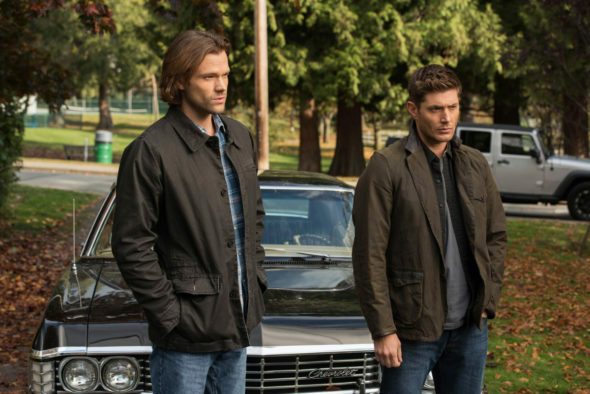 Whether the stars and producers see that number as a goal along the road so far, or the end of the hunt for the Brothers Winchester, remains to be seen. When we know more, you will, too. What do you think? Do you still like the Supernatural TV series? Should it be cancelled or renewed for season 14? How long would you like to see it run? Let us know, below. More about: Supernatural, Supernatural: canceled or renewed?, Supernatural: ratings, The CW TV shows: canceled or renewed?, Wayward Sisters, Wayward Sisters: canceled or renewed? Supernatural on The CW: Cancelled or Renewed for Season 14? Supernatural: Cancelled or Renewed for Season 13 on The CW? Jared and Jensen. Please keep doing the show. You have so many fans. To the CW….keep this show on past season 14!! How many other shows have conventions all over the country.??? All the actors “work” together. I wish Mark Shepherd would come back. I always liked Gabriel too. He will be missed. I really only have cable TV for this show and maybe two others. If this is cancelled I’ll cancel my cable.